Hi there fans. Back in June I received a great birthday gift, a copy of Meathead Goldwyn’s book called “The Science of Great Barbecue and Grilling.” I’ve been a big fan of his for years and have recreated some of his signature recipes on this blog. Now, I’ve read the book from start to finish and over the past weekend I decided it was time to try out a recipe that had piqued my curiosity for a while. In the book the recipe is called “Happy Mouth Yakitori Ribs” and I must admit, it didn’t disappoint! I’ve not found the recipe online as yet so you’ll need to purchase the book (to be fair to my pal Meathead too!) That said, I’ve taken a few minor liberties with this recipe that I’m sure you’ll enjoy. The approach is pretty unconventional to say the least. With this recipe, we move away from traditional ‘low and slow’ cooking for up to 6 hours and shave that down to about 2 hours in total. The preparation also makes a regular rib cook a bit nervous as well. But, if you follow my interpretation of the recipe, you’ll wow your pals, neighbours and family with this Japanese take on pork ribs. 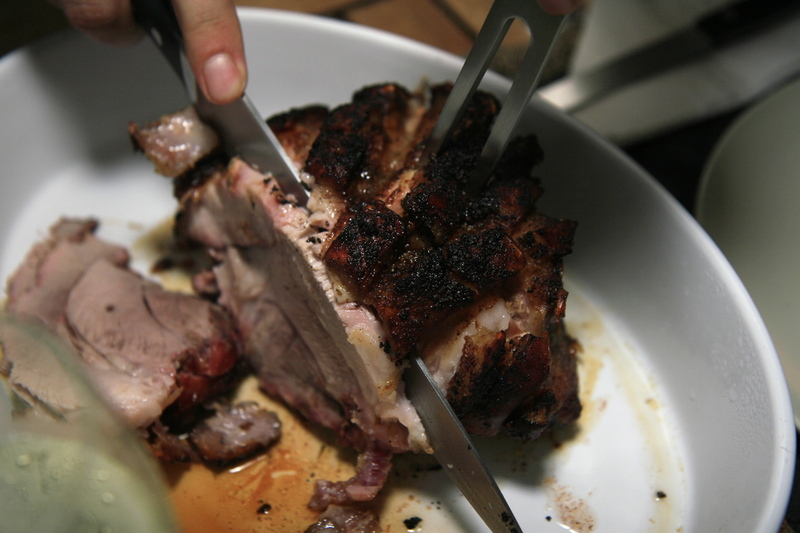 Prepare three slabs of St. Louis cut ribs by removing the silver skin from the bone side of the ribs. Start by lifting a bit off the bone with a butter knife then grab some paper towel (kitchen roll) and grab the flap and pull the membrane off completely. Now, cut the ribs into individual pieces ensuring that you’ve got an equal amount of meat on either side of the bone. Normally we’d cook the entire slab of ribs but by cutting them into individual pieces you cut the cooking time exponentially and you’ll get each rib to look and taste amazing. Traditional Yakitori uses chicken meat (from the thigh or gizzard or just about any part really) and there is no marinade used whatsoever. You rely purely on the sauce that you’ll make. For the ribs, I went with a a light dusting of salt and pepper a few hours before I was ready to cook the ribs. Seasoning the ribs helps a lot with the flavour but remember go easy, you don’t need to coat them like you would if you were smoking traditional KC style ribs. Combine the above ingredients except for the cornstarch in a medium sauce pan. Let it simmer and combine for about 30 minutes on a low/medium heat. When your timer pings, remove the saucepan from the heat and strain the liquid through a fine sieve. Squeeze out all the juice from the solids through the sieve so you’re left with nothing but liquid. Put that sauce pan back onto your burner at a low heat. The smell and taste at this point is crazy! Now, it’s time to thicken up your Yakitori sauce by mixing the corn starch with 2 tbsp of cold water. Mix it up with a fork and then add it to your sauce pan. Stir it around well and you’ll see the magic start to happen. The sauce goes a bit cloudy but will soon change viscosity to resemble something akin to motor oil. From this point, let the sauce simmer for another 15 minutes then set it aside. 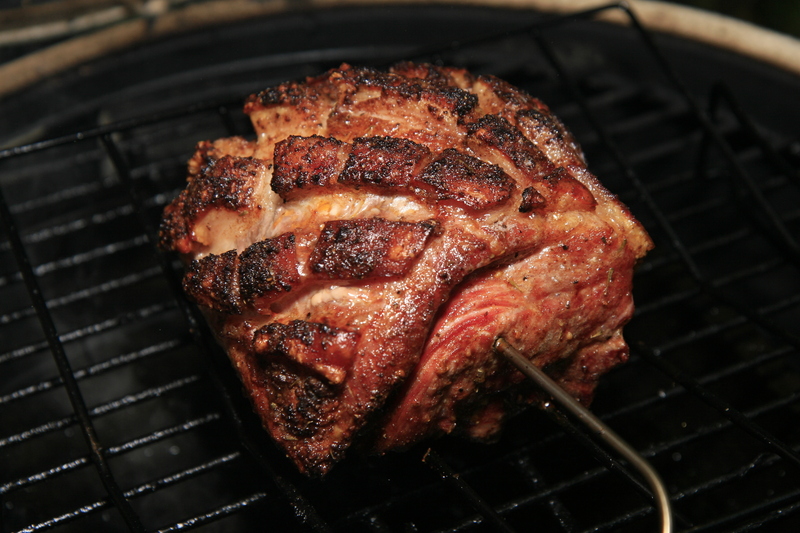 Set your grill up for indirect heat and stabilise your temperature at 225F (107C). You don’t want to add any smoke as it’ll clash with the sauce. I used a two tier grid and the Imperial Kamado I restored last year. Seemed fitting to use a Japanese kamado for a Japanese inspired dish. Let the ribs roast for about 90 minutes. They’ll turn a beautiful golden brown colour. Take them off and place them into a metal bowl that’s deep enough for you to coat all the ribs with the sauce. Carefully pour your Yakitori sauce all over the ribs and toss them around so you get an even coating on all sides of the ribs. Return the ribs to the grill and let them roast for another 20 minutes or so at 225F (107C). Once the sauce has baked on to the ribs, remove them and plate them up. I added toasted sesame seeds and some finely cut chives for good measure, great taste and a beautiful look. Now these ribs aren’t the type that slide off the bone. They take a bit of effort but as you’ll see in the pictures, all the meat comes off with a few simple bites. I like to work for by ribs! All in all, an amazing new twist on pork ribs! Thanks Meathead and to the team at Amazing Ribs! The family loved them and the neighbour’s kids devoured the few leftover ribs that we had.